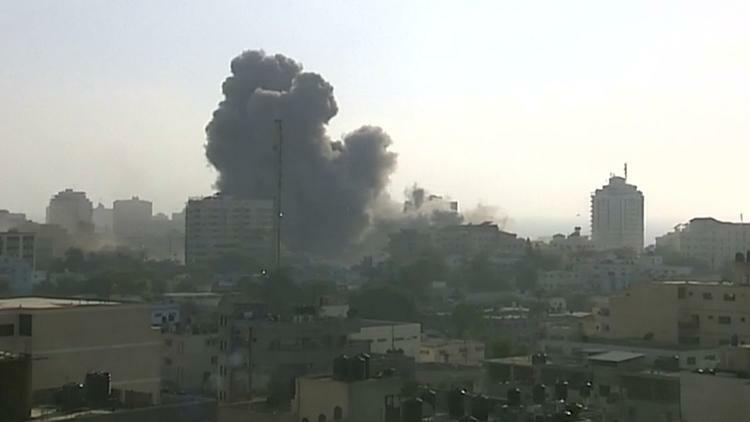 Caracas (TeleSur) – Israeli occupation forces struck 40 targets in the besieged Gaza Strip Saturday, in the most extensive Israeli military assault since the 2014 “Operation Protective Edge” in which over 1,400 Palestinians were killed. Tensions in Gaza have been on the rise since Israeli forces have killed over 130 people participating in the Great March of Return and wounded thousands. On Friday, after an Israeli soldier was mildly wounded by a Palestinian protester who threw a hand-grenade Israel retaliated by striking “Hamas targets”. Since then Gaza militants launched around 60 rockets and mortars into Israel, causing minor damage to a synagogue and reportedly wounding two Israelis who are not in a critical state. However, Israeli airstrikes Saturday have injured hundreds of civilians, and killed two Palestinian teens who were at a public park next to a unfinished building, Gaza’s Health Ministry reported. “A tunnel was dug under the building and used for underground warfare training. This tunnel is part of a Hamas terror tunnel network,” a statement by the Israeli army said. Ameer Al-Numra and Lo’ay Kuhail were killed after Israeli snipers killed two other teens Friday near the wire fence. Egypt is currently engaging in diplomatic efforts to reach a ceasefire but that possibility remains uncertain.